P.O. Box 1149 , 201 East 12th Street, Coffeyville, Kansas 67337 U.S.A. The Hydromatic® Brake or Hydrotarder® is a hydrodynamic device that absorbs power by converting mechanical energy into heat in its working fluid, which is normally water. 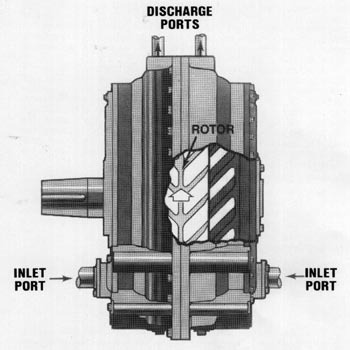 Resistance is created exclusively by fluid friction and agitation of the fluid circulated between the vaned pockets of the rotor and stator elements with the conversion of mechanical energy to heat taking place directly within the fluid itself. The amount of mechanical energy that can be absorbed in this manner is dependent upon the quantity and velocity of the fluid in the working chamber. It will be readily seen that with any specific quantity of fluid in the working chamber, the velocity of the fluid will be increased with increased revolving speed of the rotor. In this manner the horsepower capacity of the Hydromatic® Brake or Hydrotarder® increases approximately in proportion to the cube of the speed; if the speed is doubled, the horsepower resistance is increased eight times. The hydraulic horsepower capacity increases at this rate to the maximum operating speed of the brake. It should be noted, however, that other limitations such as shaft diameter and fluid flow capacity may be the limiting factor instead of speed. The new and improved Hydromatic® Brakes are as easy and simple to operate as ever. Any Driller can operate them without previous experience or special training. All that needs to be done is to open or close the valve that controls the water level in the brake circulating system. Today's Hydromatic® Brakes are the result of years of continuous research and improvement. Drillers who have tried them say the new, improved Hydromatic® Brakes are definitely better than ever and still the best auxiliary drawworks brake ever offered.